What are the consequences of heavy metals on our organism? 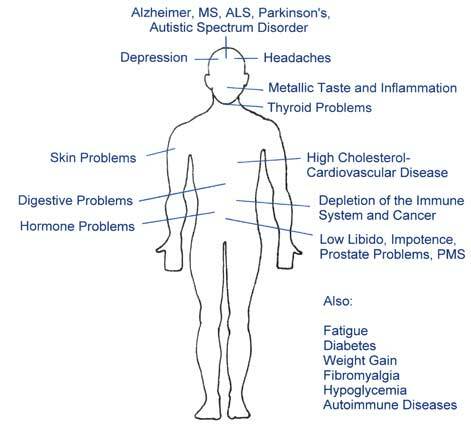 Heavy Metals can directly or indirectly cause, contribute to, or make worse, nearly every disease or illness we know. If you are heavy metal toxic and don’t take any medical treatment you may now receiving for any existing health problem may not be as successful as it could be. Thus, if you want your efforts at dealing with any existing health conditions related to chronic metal poisoning to be more successful and want to achieve an optimal state of health; you will need to make effort to safely eliminate heavy metals from your body. The overproduction of free radicals is the major reason for all degenerative diseases! Free radicals or oxidation leads to a loss of electrons which leads to a loss of protons. Consequently our blood becomes more alkaline (loss of protons) and the urine pH (concentration of protons) becomes acid. The protons are eliminated out of the body through the urine. To a certain extent the body’s elimination system is able to get rid of these excess of protons; nonetheless a slowly accumulation of protons into the connective tissue and finally an absorption into the cell (intra-cellular) occurs. Once the proton has entered the cell and in order to maintain electrical balance, (intra-cellular) potassium and magnesium will be excreted and washed out with the urine. Finally an overall body (tissue) acidification takes place. In an acid environment all metabolic and digestive processes are slowed down, kidney function is diminished, and all enzyme activity is also decreased. 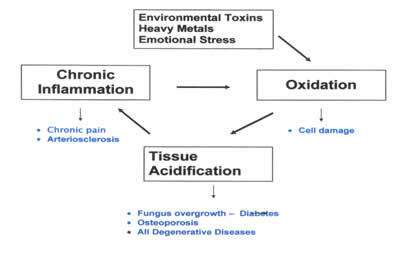 Finally, an acid environment sets the perfect terrain for chronic inflammation, a major source of free radical production, and the vicious cycle is completed. Heavy Metals like cadmium, lead, mercury, nickel and more are so pervasive in our society today. There is no longer a question of whether or not we are toxic, but rather what our level of toxicity is. In the human system, the bivalent metals are engaged in a continuous fight against one another, e.g. copper against zinc, magnesium against calcium, which results in the replacement of the "lighter" element by the "heavier" one in terms of their atomic masses. Replacement reactions, also called fight for the site, occur when heavy metals grab the biological spaces that should be filled by necessary minerals. Just as carbon monoxide replaces essential oxygen, other elements and compounds cause their toxic effect by replacing chemicals essential to the body functions. Within a group, for example group 2 in the periodic table of elements (2 refers to the number of extra electron) there is zinc (Zn), cadmium (Cd), and mercury (Hg), in order of increasing atomic weight (65, 112 and 200 respectively). Zinc in its ionic form, Zn2+, is necessary for proper body function, although an excess is toxic. Cadmium, found in paints, cigarettes, tires, and brakes, is toxic. Mercury, found in amalgam fillings, paints, and some industrial processes, has no known use in the body and is even more poisonous. Since cadmium and mercury, in their more soluble ionized or salt forms, will attempt to participate in the same biochemical reactions as zinc, their presence will prevent the zinc reacting and performing its functions in the body. This is like a 65 pound person (zinc) competing unsuccessfully with 112 pound (cadmium) and 200 pound (mercury) people in a game of musical chairs. 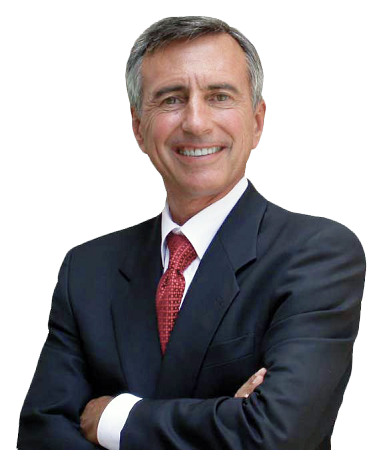 As a result, mercury leaching into the body from silver-mercury amalgam fillings will cause symptoms of zinc deficiency such as fatigue, PMS, thyroid problem, loss of smell and taste, macular degeneration, prostate enlargement, rheumatoid arthritis, sterility, immune suppression, etc., even if there is plenty of zinc available. Heavy metals - especially mercury - are highly toxic, killing the friendly bacteria in our guts. Friendly bacteria are responsible for a beneficial gut flora and the internal mucosa which protects the gut from toxins or allergens. Therefore, a compromised gut opens the door to all kind of toxins and allergens, which, in turn overburdens the immune-system and leads finally to all kind of allergies. Heavy metals eventually bind to body proteins. The immune system recognizes these proteins as a foreign and attacks them, leading to so-called autoimmune disorders. All skin problems originate in the intestine which has been damaged by toxins (heavy metals), non-nutritious, processed and refined foods, anti-biotic use and stress. A rise in cholesterol typically accompanies the inflammatory response and it serves to protect the nerve and brain against exposure to fat-soluble toxins and heavy metals. Studies show that when decreasing the cholesterol level with medication there is a corresponding rise in all cause mortality, which includes a higher risk in cancer, mini-strokes and suicide. Heavy metals increase the production of free radicals and oxidative stress leading to tissue acidification. All Cancer cells thrive in an acid environment! Having a constant inflammatory response to heavy metals (fight or flight reaction) the cancer killing immune system becomes depleted. When this happens cancer cells proliferate. Heavy metals create an over-production of free radicals (rust), leading to chronic inflammation(pain). Chronic inflammation generates a further overproduction of free radicals. In order to stop this vicious circle, heavy metals must be eliminated first. Heavy metals combine with bile from the gallbladder and cause it to become more alkaline, providing a favorable environment for parasites and bacteria. The immune system is suppressed by heavy metals - thus parasites and bacteria find an opportunistic environment. The parasites plug up the hepatic or bile duct so that needed digestive enzymes are not released. With a blocked gallbladder, good oils are not processed. Without enough oils, hormone production is affected. Adrenal glands can weaken and burn out as they are trying to self regulate the compromising effects of heavy metals. This leads to fatigue, as the adrenal glands put out adrenaline, the energy hormone. Heavy metals bind to oxygen and hemoglobin in blood, lowering blood and tissue oxygen, causing lack of energy and cancer development. Cancer thrives on low-oxygen environment. All heavy metals are neurotoxic, increasing the free radical production a million fold and destroying the nervous tissue. In order to dilute toxins (heavy metals) the body retains water and fats in the adipose tissue. Heavy metals replace essential minerals, also called “the fight for the site”. The heavy metals grab the biological spaces which should be filled by necessary minerals instead. Since essential copper and iodine ions are not being absorbed the thyroid function becomes compromised. Heavy metals lower (replace) zinc levels which are necessary for the proper levels of progesterone and testosterone. Heavy metals - in particular mercury - sets the perfect terrain for the overgrowth of yeast and fungus (candida). Metabolic waste released from fungus, called mycotoxins, inhibits the absorption of insulin, thus creating diabetes. By decreasing the sugar intake, the yeast and fungus proliferation will decrease; but it will not solve the real cause, which are heavy metals.